Harris Chronicles: Happy Birthday Allen/Daddy! That's right. Today is Allen's 31st birthday, and the second one he is celebrating in Iraq. Had I been more on the ball, I would have made a video for him with Ashlyn dancing to Happy Birthday. However, I was not on the ball, and it is no longer his birthday where he is. I hope you had a good one, Allen. We love you and miss you! 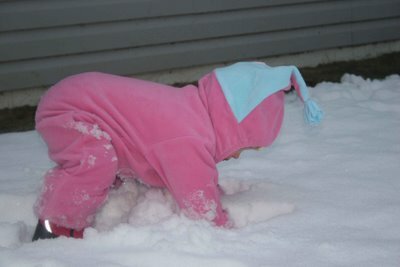 Here are a couple of pictures of Ashlyn playing outside yesterday. 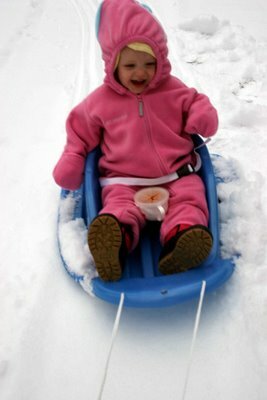 She loved her sled! It was very difficult to pull her with one hand, while being pulled by Ranger with the other. 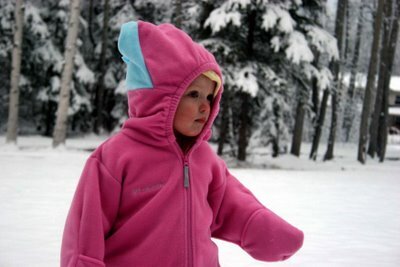 Something about this picture reminds me of Ezra Keat's Snowy Day. Probably just the snow suit. For those of you who are really on here to look at pictures of Ashlyn, I hope that you have clicked on my flickr photos. I add extra pictures to that, too. It does look like the Snowy Day book! So cute. Is that a cup in her sled with her?? Delayed comment, SORRY!! Happy Birthday Allen!! Sorry that you are having to spend your day over there. I can't wait until you are home with your wonderful wife and daughter. This Christmas is going to be one for the books. I count down the days until you are home. You are in my thoughts. As you said to Chris when he was gone... keep your head down.